On the Fahrenheit scale, the freezing point of water is 32 degrees Fahrenheit (°F) and the boiling point is 212 °F (at standard atmospheric pressure). This puts the boiling and freezing points of water 180 degrees apart. Therefore, a degree on the Fahrenheit scale is ​1⁄180 of the interval between the freezing point and the boiling point. On the Celsius scale, the freezing and boiling points of water are 100 degrees apart. A temperature interval of 1 °F is equal to an interval of ​5⁄9 degrees Celsius. The Fahrenheit and Celsius scales intersect at −40° (i.e., −40 °F = −40 °C). Absolute zero is −273.15 °C or −459.67 °F. The Rankine temperature scale uses degree intervals of the same size as those of the Fahrenheit scale, except that absolute zero is 0 °R — the same way that the Kelvin temperature scale matches the Celsius scale, except that absolute zero is 0 K.
c °Celsius to f °Fahrenheit : ((c + 40) × 1.8) − 40 = f.
Daniel Gabriel Fahrenheit, a pioneer of exact thermometry (temperature measurement). He invented the mercury thermometer (first practical, accurate thermometer) and Fahrenheit scale (first widely used, standardized temperature scale). Fahrenheit proposed his temperature scale in 1724, basing it on two reference points of temperature. In his initial scale (which is not the final Fahrenheit scale), the zero point was determined by placing the thermometer in a mixture "of ice, of water, and of ammonium chloride (salis Armoniaci) or even of sea salt". This combination forms a eutectic system which stabilizes its temperature automatically: 0 °F was defined to be that stable temperature. The second point, 96 degrees, was approximately the human body's temperature (sanguine hominis sani, the blood of a healthy man). According to a story in Germany, Fahrenheit actually chose the lowest air temperature measured in his hometown Danzig in winter 1708/09 as 0 °F, and only later had the need to be able to make this value reproducible using brine. According to a letter Fahrenheit wrote to his friend Herman Boerhaave, his scale was built on the work of Ole Rømer, whom he had met earlier. In Rømer's scale, brine freezes at zero, water freezes and melts at 7.5 degrees, body temperature is 22.5, and water boils at 60 degrees. Fahrenheit multiplied each value by four in order to eliminate fractions and make the scale more fine-grained. 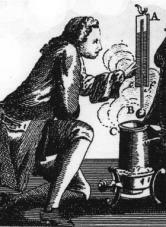 He then re-calibrated his scale using the melting point of ice and normal human body temperature (which were at 30 and 90 degrees); he adjusted the scale so that the melting point of ice would be 32 degrees and body temperature 96 degrees, so that 64 intervals would separate the two, allowing him to mark degree lines on his instruments by simply bisecting the interval six times (since 64 is 2 to the sixth power). Fahrenheit soon after observed that water boils at about 212 degrees using this scale. The use of the freezing and boiling points of water as thermometer fixed reference points became popular following the work of Anders Celsius and these fixed points were adopted by a committee of the Royal Society led by Henry Cavendish in 1776. Under this system, the Fahrenheit scale is redefined slightly so that the freezing point of water is exactly 32 °F, and the boiling point is exactly 212 °F or 180 degrees higher. It is for this reason that normal human body temperature is approximately 98° (oral temperature) on the revised scale (whereas it was 90° on Fahrenheit's multiplication of Rømer, and 96° on his original scale). In the present-day Fahrenheit scale, 0 °F no longer corresponds to the eutectic temperature of ammonium chloride brine as described above. Instead, that eutectic is at approximately 4 °F on the final Fahrenheit scale. The Rankine temperature scale was based upon the Fahrenheit temperature scale, with its zero representing absolute zero instead. Countries that use Fahrenheit (°F). Countries that use Celsius (°C). The Fahrenheit scale was the primary temperature standard for climatic, industrial and medical purposes in English-speaking countries until the 1960s. In the late 1960s and 1970s, the Celsius scale replaced Fahrenheit in almost all of those countries—with the notable exception of the United States—typically during their general metrication process. Fahrenheit is used in the United States, its territories and associated states (all served by the U.S. National Weather Service), as well as the Bahamas, the Cayman Islands and Liberia for everyday applications. For example, U.S. weather forecasts, food cooking, and freezing temperatures are typically given in degrees Fahrenheit. Scientists, such as meteorologists, use degrees Celsius or kelvin in all countries. Early in the 20th century, Halsey and Dale suggested that the resistance to the use of centigrade (now Celsius) system in the U.S. included the larger size of each degree Celsius and the lower zero point in the Fahrenheit system. Canada has passed legislation favoring the International System of Units, while also maintaining legal definitions for traditional Canadian imperial units. Canadian weather reports are conveyed using degrees Celsius with occasional reference to Fahrenheit especially for cross-border broadcasts. Fahrenheit is still used on virtually all Canadian ovens, and in reference to swimming pool temperatures and thermostats. Thermometers, both digital and analog, sold in Canada usually employ both the Celsius and Fahrenheit scales. European laundry symbol for "Wash at 40 °C"
In the European Union, it is mandatory to use kelvins or degrees Celsius when quoting temperature for "economic, public health, public safety and administrative" purposes, though degrees Fahrenheit may be used alongside degrees Celsius as a supplementary unit. For example, the laundry symbols used in the United Kingdom follow the recommendations of ISO 3758:2005 showing the temperature of the washing machine water in degrees Celsius only. The equivalent label in North America uses one to six dots to denote temperature with an optional temperature in degrees Celsius. Within the unregulated sector, such as journalism, the use of Fahrenheit in the United Kingdom follows no fixed pattern with degrees Fahrenheit often appearing alongside degrees Celsius. The Daily Mail, on its daily weather page, quotes Celsius first, followed by Fahrenheit in brackets, The Daily Telegraph does not mention Fahrenheit on its daily weather page while The Times also has an all-metric daily weather page but has a Celsius-to-Fahrenheit conversion table. When publishing news stories, much of the UK press have adopted a tendency of using degrees Celsius in headlines and discussion relating to low temperatures and Fahrenheit for high temperatures. In February 2006, the writer of an article in The Times suggested that the rationale was one of emphasis: "−6 °C" sounds colder than "21 °F" and "94 °F" sounds more impressive than "34 °C". Unicode provides the Fahrenheit symbol at code point U+2109 ℉ DEGREE FAHRENHEIT. However, this is a compatibility character encoded for roundtrip compatibility with legacy encodings. The Unicode standard explicitly discourages the use of this character: "The sequence U+00B0 ° DEGREE SIGN +U+0046 F LATIN CAPITAL LETTER F is preferred over U+2109 ℉ DEGREE FAHRENHEIT, and those two sequences should be treated as identical for searching." ^ Robert T. Balmer (2010). Modern Engineering Thermodynamics. Academic Press. p. 9. ISBN 978-0-12-374996-3. Retrieved 17 July 2011. ^ "Fahrenheit: Facts, History & Conversion Formulas". Live Science. Retrieved 9 February 2018. ^ a b Walt Boyes (2009). Instrumentation Reference Book. Butterworth-Heinemann. pp. 273–274. ISBN 978-0-7506-8308-1. Retrieved 17 July 2011. ^ Preston–Thomas, H. (1990). "The International Temperature Scale of 1990 (ITS-90)" (PDF). Metrologia. 27 (1): 6. Bibcode:1990Metro..27....3P. doi:10.1088/0026-1394/27/1/002. Retrieved 17 July 2011. Nicolas Lémery, Cours de chymie … , 7th ed. (Paris, France: Estienne Michallet, 1688), Chapitre XVII: du Sel Armoniac, pp. 338–339. ^ "Wetterlexikon - Lufttemperatur" (in German). Deutscher Wetterdienst. Archived from the original on 15 October 2013. Retrieved 13 December 2013. ^ Frautschi, Steven C.; Richard P. Olenick; Tom M. Apostol; David L. Goodstein (14 January 2008). The mechanical universe: mechanics and heat. Cambridge University Press. p. 502. ISBN 978-0-521-71590-4. ^ Cecil Adams (15 December 1989). "On the Fahrenheit scale, do 0 and 100 have any special significance?". The Straight Dope. ^ Hasok Chang, Inventing Temperature: Measurement and Scientific Progress, pp. 8–11, Oxford University Press, 2004 ISBN 0198038240. ^ Elert, Glenn; Forsberg, C; Wahren, LK (2002). "Temperature of a Healthy Human (Body Temperature)". Scandinavian Journal of Caring Sciences. 16 (2): 122–8. doi:10.1046/j.1471-6712.2002.00069.x. PMID 12000664. Archived from the original on 26 September 2010. Retrieved 12 April 2008. Peppin SS, Huppert HE, Worster MG (2008). "Steady-state solidification of aqueous ammonium chloride" (PDF). J. Fluid Mech. Cambridge University Press. 599: 472 (table 1). doi:10.1017/S0022112008000219. Barman N, Nayak AK, Chattopadhyay H (2014). "Solidification of a Binary Solution (NH4Cl+H2O) on an Inclined Cooling Plate: A Parametric Study" (PDF). Procedia Materials Science. 5: 456 (table 1). doi:10.1016/j.mspro.2014.07.288. ^ "782 - Aerodrome reports and forecasts: A user's handbook to the codes". World Meteorological Organization. Retrieved 23 September 2009. ^ "Canadian Units of Measurement; Department of Justice, Weights and Measures Act (R.S.C., 1985, c. W-6)". 17 May 2011. Archived from the original on 13 May 2011. Retrieved 5 June 2011. ^ Pearlstein, Steven (4 June 2000). "Did Canada go metric? Yes - and no". The Seattle Times. Retrieved 5 June 2011. ^ "Example of analog thermometer frequently used in Canada". Archived from the original on 6 July 2011. Retrieved 6 June 2011. ^ "Example of digital thermometer frequently used in Canada". Archived from the original on 6 July 2011. Retrieved 6 June 2011. ^ Department of Justice (26 February 2009). "Canadian Weights and Measures Act". Federal Government of Canada. Archived from the original on 10 August 2011. Retrieved 17 July 2011. ^ "Home Laundering Consultative Council - What Symbols Mean". Home Laundering Consultative Council. Retrieved 15 July 2013. ^ "Guide to Common Home Laundering & Drycleaning Symbols". Textile Industry Affairs. 2010. Retrieved 15 July 2013. ^ "Guide to Apparel and Textile Care Symbols". Office of Consumer Affairs, Government of Canada. 17 April 2003. Retrieved 15 July 2013. ^ "Weather". The Daily Mail. 3 July 2013. p. 3. ^ "Weather". The Daily Telegraph. 3 July 2013. p. 31. ^ "Weather". The Times. 3 July 2013. p. 55. ^ Roy Greenslade (29 May 2014). "Newspapers run hot and cold over Celsius and Fahrenheit". The Guardian. ^ "Measure for measure". The Times. Times Newspapers. 23 February 2006. ^ "22.2". The Unicode Standard, Version 8.0 (PDF). Mountain View, CA, USA: The Unicode Consortium. August 2015. ISBN 978-1-936213-10-8. Retrieved 6 September 2015. 7800° Fahrenheit is the second studio album by American rock band Bon Jovi. It was released on March 27, 1985, through Mercury Records. The album's title was a reference to the supposed melting point of rock, equivalent to 4313° Celsius; as the Fahrenheit scale is mainly used only in the United States, 7800° Fahrenheit thus suggested "American hot rock. "The album introduced the classic 1980s Bon Jovi logo that would later be used on Slippery When Wet and New Jersey. 7800° Fahrenheit reached #37 on the Billboard 200 albums chart and was the band's first album to be certified gold in the US. It remained charted for 85 weeks and was certified platinum on February 19, 1987. The singles "Only Lonely" and "In and Out of Love" both charted on the Billboard Hot 100. Adrian Fahrenheit Țepeș (アドリアン・ファーレンハイツ・ツェペシュ, Adorian Fārenhaitsu Tsepeshu), better known as Alucard (アルカード, Arukādo), is a character in Konami's Castlevania series of video games. His first appearance in the series was in the 1989 game Castlevania III: Dracula's Curse, but he is best known for his role in the critically acclaimed Castlevania: Symphony of the Night, released in 1997. His design in Symphony of the Night was created by Ayami Kojima, marking her first contribution to the Castlevania franchise. In the series, Alucard is the son of Dracula, the antagonist of the Castlevania series. Due to his human mother, Lisa, Alucard is a dhampir, a half-human, half-vampire. His mother's death and admonition not to hate humanity caused him to take up arms against his father. In Dracula's Curse and Castlevania Legends, he fights against his father alongside the vampire hunters of the Belmont clan, and he is featured as the protagonist of Symphony of the Night. Alucard additionally is present in Castlevania: Aria of Sorrow and the follow-up sequel Castlevania: Dawn of Sorrow, where he interacts with the protagonist of both games, Soma Cruz, as the Japanese government agent Genya Arikado (有角 幻也, Arikado Gen'ya). The Lords of Shadow reboot series, starting with the character's introduction in Castlevania: Lords of Shadow – Mirror of Fate, changes Alucard's backstory, revealing him as Trevor Belmont, once a mortal who was transformed into a vampire after his death at the hands of his biological father, the remorseful Dracula. Several video game publications have provided praise and criticism on Alucard's character. In Aria of Sorrow and Dawn of Sorrow, where Alucard was present as Genya Arikado, reviewers noted that although he fell into a stereotypical character mold, the greater concentration on supporting characters was a welcomed change from previous Castlevania games. Fahrenheit (known as Indigo Prophecy in North America) is a cinematic interactive drama action-adventure video game developed by Quantic Dream and published by Atari, Inc. for the PlayStation 2 and Xbox. The director's cut and uncut versions were later released for Microsoft Windows. Fahrenheit sold over 1 million copies and has won several awards. On December 4, 2007, Atari released the game for Xbox 360 through Xbox Originals.On November 8, 2011, Quantic Dream released the game uncensored for PC through GOG.com. A remastered version of the game, entitled Fahrenheit: Indigo Prophecy Remastered, was developed and published by Aspyr in January 2015 for Microsoft Windows, OS X, Linux and iOS. A port for the PlayStation 4, which was developed by International Software Development Group at Sony Interactive Entertainment, was released on August 9, 2016 via PlayStation Network. Fahrenheit is a paranormal thriller, in which New York City experiences a series of mysterious murders that follow the same pattern; ordinary people become possessed and kill strangers in public. The main characters of the story must uncover the supernatural forces behind these crimes. Publicity was generated from the developer's rejection of conventional game genre labeling; preferring to brand it as the first "interactive film" rather than an adventure or third-person action title. The game features motion captured animation as well as branching story lines, split screen cameras and an interface designed to be intuitive and realistic. Event triggers in the game are also mainly time-based, as opposed to the more common player-initiated progression found in most games. Fahrenheit (Chinese: 飛輪海; pinyin: Fēilúnhǎi) is a Taiwanese boy band composed of members Calvin Chen, Jiro Wang, Wu Chun, and Aaron Yan. They were formed in 2005 by Comic International Productions and HIM International Music. Their music is distributed by WOW Music in Hong Kong and by Pony Canyon in Japan. Fahrenheit ware often associated with their labelmate seniors S.H.E, who are also under HIM International Music. In June 2011, Wu announced his decision to leave the group to focus on his acting career, but is open to the idea of reuniting with Fahrenheit in the future. Following Wu Chun's departure, the remaining members also went off to pursue solo projects, putting the group in an indefinite hiatus. Fahrenheit is a tiny lunar impact crater located in the southeast part of the Mare Crisium. This area of the surface is nearly devoid of impact features of interest. To the east are the Dorsa Harker wrinkle ridges, and beyond them is Promontorium Agarum at the edge of the mare. The landing site of the Soviet Luna 24 probe is located about 15 kilometers to the southeast. The crater is named after German-Dutch physicist Daniel Gabriel Fahrenheit. It was previously designated Picard X. The crater Picard is located to the east-northeast on the Mare Crisium. Fahrenheit is a steel roller coaster at Hersheypark in Hershey, Pennsylvania. Located in the Pioneer Frontier section of the park, the roller coaster opened on May 24, 2008. It features six inversions and became the steepest roller coaster in the world when it opened with its first drop of 97 degrees. Fahrenheit briefly held the record until Steel Hawg at Indiana Beach, which featured a 111-degree drop, opened several weeks later on July 5. It is now the 7th steepest roller coaster in the world. Fahrenheit 11/9 is a 2018 American political documentary by filmmaker Michael Moore about the 2016 United States presidential election and the subsequent presidency of Donald Trump. The film had its world premiere on September 6, 2018 at the 2018 Toronto International Film Festival, and was released in the United States on September 21, 2018, by Briarcliff Entertainment. It grossed $6.7 million worldwide, one of the lowest totals of Moore's career. It received mostly positive reviews, with review aggregator website Rotten Tomatoes saying it "[preaches] to a specific choir, but for anyone who's enjoyed Moore's filmography [it is] another worthy chapter. "The film received a nomination for Best Documentary Screenplay from the Writers Guild of America. It also received four nominations at the 39th Golden Raspberry Awards and won three, including worst actor for Donald Trump. Fahrenheit 451 is a dystopian novel by American writer Ray Bradbury, first published in 1953. It is regarded as one of his best works. The novel presents a future American society where books are outlawed and "firemen" burn any that are found. The book's tagline explains the title: "Fahrenheit 451 – the temperature at which book paper catches fire, and burns..." The lead character, Guy Montag, is a fireman who becomes disillusioned with his role of censoring literature and destroying knowledge, eventually quitting his job and committing himself to the preservation of literary and cultural writings. The novel has been the subject of interpretations focusing on the historical role of book burning in suppressing dissenting ideas. In a 1956 radio interview, Bradbury said that he wrote Fahrenheit 451 because of his concerns at the time (during the McCarthy era) about the threat of book burning in the United States. In later years, he described the book as a commentary on how mass media reduces interest in reading literature.In 1954, Fahrenheit 451 won the American Academy of Arts and Letters Award in Literature and the Commonwealth Club of California Gold Medal. It later won the Prometheus "Hall of Fame" Award in 1984 and a "Retro" Hugo Award, one of only six Best Novel Retro Hugos ever given, in 2004. Bradbury was honored with a Spoken Word Grammy nomination for his 1976 audiobook version.Adaptations of the novel include François Truffaut's 1966 film adaptation and a 1982 BBC Radio dramatization. Bradbury published a stage play version in 1979 and helped develop a 1984 interactive fiction computer game titled Fahrenheit 451, as well as a collection of his short stories titled A Pleasure to Burn. HBO released a television film based on the novel and written and directed by Ramin Bahrani in 2018. Fahrenheit 451 is a 1966 British dystopian drama film directed by François Truffaut and starring Oskar Werner, Julie Christie, and Cyril Cusack. Based on the 1953 novel of the same name by Ray Bradbury, the film takes place in a controlled society in an oppressive future in which the government sends out firemen to destroy all literature to prevent revolution and thinking. This was Truffaut's first colour film as well as his only English-language film. At the 1966 Venice Film Festival, Fahrenheit 451 was nominated for the Golden Lion. Fahrenheit 451 is a 2018 American dystopian drama film written and directed by Ramin Bahrani, based on the book of the same name by Ray Bradbury. It stars Michael B. Jordan, Michael Shannon, Sofia Boutella, Lilly Singh, Grace Lynn Kung and Martin Donovan. Set in a future America, the film follows a "fireman" whose job it is to burn now-illegal books, only to question society after meeting a young woman. After premiering at the 2018 Cannes Film Festival, the film aired on HBO on May 19, 2018 to mixed critical reviews. The film debuted at the 2004 Cannes Film Festival and received a 20-minute standing ovation, among the longest standing ovations in the festival's history. The film was also awarded the Palme d'Or, the festival's highest award. The film is the highest grossing documentary of all time. Michael Francis Moore (IPA: , respell: MOOR; born April 23, 1954) is an American documentary filmmaker and author. He is best known for his work on globalization and capitalism.Moore won the 2002 Academy Award for Best Documentary Feature for Bowling for Columbine, which examined the supposed causes of the Columbine High School massacre and the overall gun culture of the United States. He also directed and produced Fahrenheit 9/11, a critical look at the presidency of George W. Bush and the War on Terror, which earned $119,194,771 to become the highest-grossing documentary at the American box office of all time. The film also won the Palme d'Or at the 2004 Cannes film festival. His documentary Sicko, which examines health care in the United States, is one of the top ten highest-grossing documentaries. In September 2008, he released his first free movie on the internet, Slacker Uprising, which documented his personal quest to encourage more Americans to vote in presidential elections. He has also written and starred in the TV shows TV Nation, a satirical news-magazine television series, and The Awful Truth, a satirical show. In 2018 he released his latest film, Fahrenheit 11/9, a documentary about the 2016 United States presidential election and the subsequent presidency of Donald Trump. Quantic Dream SA is a French video game developer based in Paris. Founded in June 1997, Quantic Dream has developed five video games: The Nomad Soul (1999), Fahrenheit (2005), Heavy Rain (2010), Beyond: Two Souls (2013), and Detroit: Become Human (2018). Quantic Dream is known for promoting interactive storytelling, with founder David Cage as the primary creative force. The Rawah Wilderness is administered by the USDA Forest Service. It is located on the Canyon Lakes Ranger District of the Roosevelt National Forest in Colorado, near the Wyoming border, and also in the Routt National Forest to its south. It encompasses 76,394 acres (309.16 km2) and includes 25 named lakes ranging in size from five to 39 acres (20,000 to 160,000 m2). There are 85 miles (137 km) of trails in the area and elevation ranges from 8,400 feet (2,600 m) to 13,000 feet (4,000 m). Much of the area is traversed by the Medicine Bow Mountains and the Rawah Range for which it is named. The temperature in the Rawah Wilderness ranges from a low of 5 degrees Fahrenheit during the winter and a high of 77 degrees Fahrenheit during the summer. Ray Douglas Bradbury (; August 22, 1920 – June 5, 2012) was an American author and screenwriter. He worked in a variety of genres, including fantasy, science fiction, horror, and mystery fiction. Upon his death in 2012, The New York Times called Bradbury "the writer most responsible for bringing modern science fiction into the literary mainstream".